At Premium IT Services, we don’t simply manage to repair your laptops; in fact, our master experts are extensively qualified and experienced to manage numerous tablet issues you may be facing. The very efficient team is highly knowledgeable in the genre of repairing any kind of damage occurred to your tablet in our work shop, thus giving us the opportunity to proclaim ourselves as the leading tablet repair service providers around. Be it a cracked screen, or hardware or installation error; we can repair it all within a jiffy. With the advancement of technology every passing day, our expert specialists are ceaselessly attempting to stay up-to-date with the latest and the most recent techniques of repair. We understand it very well how delicate tablets are, and have repaired many damaged ones from being accidently dropped. In fact, we also understand how costly and expensive they are, and that is the reason we offer free diagnosis of the impending issues and keep our prices to be extremely competitive from the very initiation of the job. 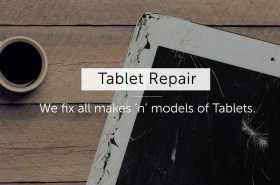 As a matter of fact, keeping customer’s satisfaction at the superior priority we also offer an additional offer a 12 month guarantee on all your tablet repairs, so just in case you experience any kind of manufacturing defect after our repair work, we will replace the part free of cost for you. We have created a niche for ourselves in the business with years of existence and consistently providing phenomenal services to all our clients. Understanding the fact that a tablet is certainly one of the most important components of your daily life, we have always tried to cater to the impending issues well within a day, so that you can return back to your regular life without any hassle. However, it would be highly appreciated if you get in touch with us at the earliest, as it will help us to repair you tablets promptly and give it better chances of recovery. Kindly don’t attempt and repair the tablet yourself as you could bring about more harm or even worse, permanently damage it! With our very outstanding customer support, we will constantly keep you updated with the status of your tablet recovery. For more information about Tablet Repair in Bray, call us at 0831264344 or simply shoot us an email at michael@premiumit.ie. We will be happy to assist you!